Tonight I went to Filmstaden Sergel to watch the new Miami Vice movie. 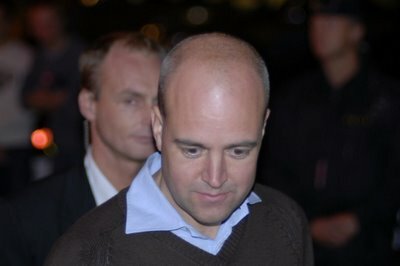 In the square outside the cinema, Moderate party leader Fredrik Reinfeldt was shaking hands and signing autographs. He replied that all four of the parties in the Alliance are pretty much assured of getting more than 4% of the vote in tomorrow's election, and that it thefore makes sense to vote for the specific party that most closely matches one's views. I enjoyed the final debate between party leaders last night on SVT. I look forward to casting my vote tomorrow morning. This will be my first time to cast a vote in a national election here in Sweden, so I am excited about it. If it's possible, I will capture a photo of the polling place, and post it here tomorrow around lunchtime. By this time tomorrow night, we'll know who will lead Sweden in the coming four years.